Joel Long started tattooing on the 4th of July I 1992. Instead of enjoying a fireworks display, he chose to stay home and tattoo himself. He was inspired by traditional Japanese and American tattoos, particularly Japanese bodysuits – which explains why he specializes in and enjoys tattooing traditional Japanese tattoos like the ones featured in the gallery below. 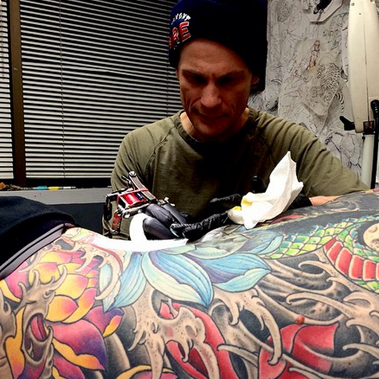 With nearly 15 years of experience, you can rest assured that any tattoo you have done by Joel will be professionally crafted and high quality. If you find yourself in Boulder, CO, we suggest looking up Bolder Ink and getting your own Joel Long original tattoo. To see more badass work by Uncle Allan and many others, check out TAM Issue 13!